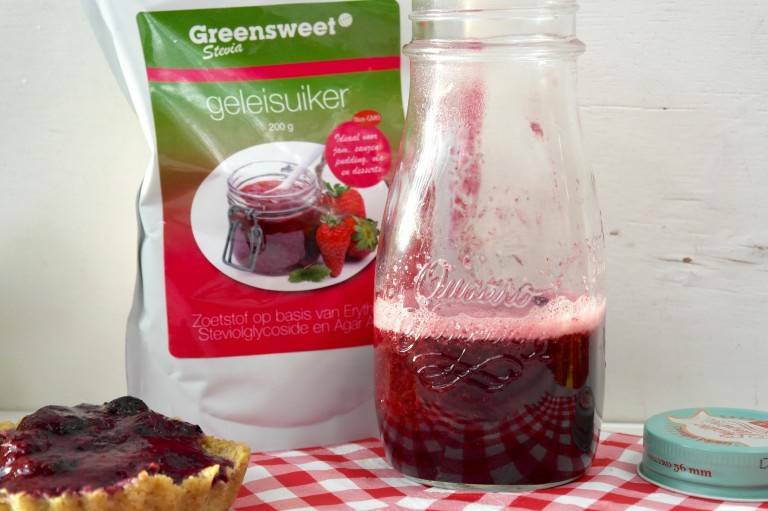 A recipe from Monique van der Vloed to make berry sauce. She has processed Greensweet Jam Jelly Crystal here. Delicious sauce to use both cold and hot over desserts / desserts, ice cream, custard, yogurt, quark, as filling in cake, pastry and cake ... .The sauce is made with the jelly crystal of Greensweet stevia. This sauce can be used both cold and warm. Pour the frozen berries together with the jelly sugar into a (preferably cast iron) pan and bring to medium heat with constant stirring to boil. As soon as the berries have melted and become soft, you can use a hand blender to lightly smooth them, but that is not necessary. If you want a smooth sauce, this is necessary. Pour the mass into a clean sterile glass jar. You can use the sauce directly hot. If you want a somewhat thinner sauce, add a tiny amount of water and stir through. You can keep the sauce well sealed for a week in the fridge. Stir in the mass equally well before use. Do you want a warm sauce such as quark or ice cream? Then heat the sauce in a pan about 3/4 of a minute on high heat.